It is planned to reintroduce the endangered Rimatara Lorikeet (‘Ura, Vini kuhlii) to Ātiu in the Cook Islands from Rimatara in French Polynesia in July 2007 to establish a reserve population. The programme is being implemented by four organisations: the Cook Islands Natural Heritage Trust (CINHT), an agency of the Cook Islands government; Te Ipukarea Society (TIS), the Cook Islands affiliate of BirdLife International; the Ornithological Society of Polynesia (MANU), the French Polynesia affiliate of BirdLife International; and Zoological Society of San Diego (San Diego Zoo). The programme has the support of President of French Polynesia Oscar Temaru, the Ministre de l'Environment, the Cook Islands Government, the community of Rimatara, and the traditional chiefs of Ātiu. Most of the funding will be provided by the 2006 British Birdwatching Fair through BirdLife International, with co-funding from Fonds Français pour le Pacifique, San Diego Zoo, NZ Department of Conservation, Air Rarotonga, and the Pacific Development and Conservation Trust. The transfer of this endangered species requires CITES approval to move it between countries, and the special support from aviation control, immigration, and quarantine to enable direct Rimatara-Ātiu flights for birds and personnel. The Southern Group of the Cook Islands and the Austral Archipelago of French Polynesia are an island chain 2000 km long. Although the chain mainly formed as the Pacific Plate passed over the Macdonald Hotspot at the southeast end, there are several anomalies and the chain has been described as a Maverick among hotspot island-chains. The islands have a closely linked biodiversity, and share several unique species. The eight islands of the Southern Group form a cluster about 300km across, while the nearest peopled-islands of the Australs are Rimatara and Rurutu, about 400km to the southeast. Although Polynesians might have first settled some of these islands around 700 AD, the present inhabitants are Eastern Polynesians from the Society Islands who arrived periodically from around 1,000 AD. Cultural links between the Southern Cooks and Australs continued after the arrival of first European settlers in the 1820s, and it was not until the 1930s that the political boundary, established in the 1880s, asserted itself as a discouragement to Cook Islands – Austral travel and communication. 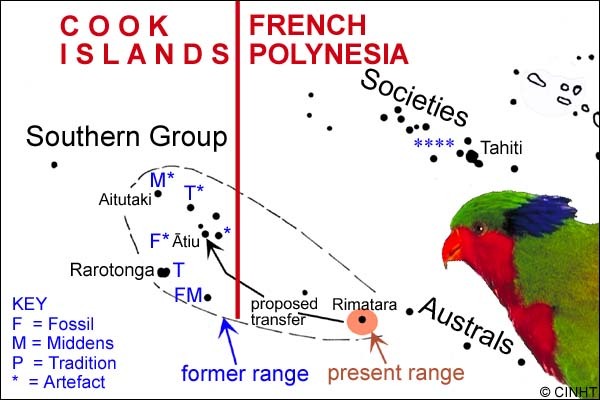 The fossil record and oral traditions show that the Rimatara Lorikeet (‘Ura) was formerly a native bird on most of the Southern Cook Islands, where it was known as the Kura. It was much prized for its small red feathers, which were used for chiefly adornment, and for decorating ceremonial headdresses [see the Ātiu headdress in the photograph above]. The chiefs of Tahiti and the Societies also anciently made extensive use of red feathers, especially on the famous red loincloth (‘ura maro). Most of the red feathers probably came from the Kura of the Cook Islands and Rimatara. Local oral tradition recounts that the last feather harvest in the Cook Islands was by a team from Aitutaki to Manuae around the time of Captain Cook’s visit in the 1770s. The lorikeet was not recorded in the Cook Islands by any European visitors, and probably became extinct in the Cook Islands before the Missionaries arrived in the 1820s. The archaeological record and early-recorded traditions indicate that the lorikeet provided red feathers in ancient times on Rimatara, while there is no indications that it was anciently on Rurutu or Tubuai. Today the Rimatara Lorikeet survives only on Rimatara, within its former natural range, and there are two populations in the northern Line Islands of Kiribati, where it was introduced in historical times. This lorikeet is listed in the IUCN RedList as "Endangered", because of its small population and limited distribution. It is also listed on Appendix II of CITES, which means it needs a CITES export permit to be moved to another country. The other two lorikeets of French Polynesia and the Cook Islands, the Blue Lorikeet (Vini peruviana) and the Ultramarine Lorikeet (Vini ultramarina), are also both on the RedList and on CITES. In 1992 Tom and Ellen Winser of England made their yacht Ardevora available to take the two Cook Islands Natural Heritage staff to Rimatara to assess the population status and habitat requirements of the Rimatara Lorikeet. The population was estimated at 900 birds and, surprisingly, most were living in the horticultural zone of the island, which was dominated by recently introduced trees and shrubs. A preliminary survey found Pacific Rat (Rattus exulans), Norway Rat (Rattus norvegicus), but no Ship Rat (Rattus rattus). Since around 1900 the other two lorikeets of French Polynesia, the Blue Lorikeet and the Ultramarine Lorikeet, have both undergone a drastic decline in numbers and been lost from several islands. There was considerable circumstantial evidence that the primary problem was the Ship Rat, which probably started spreading throughout the islands sometime after the 1850s. With the other two species of rat already present on Rimatara, the eventual arrival of Ship Rat seemed certain, and this would have inevitably lead to the extinction of the lorikeet in its last bastion within its natural range. The Natural Heritage staff recommended two actions to reduce the chance of extinction within the South Pacific: (1) increase quarantine procedures and awareness on Rimatara; and (2) establish a reserve population on a Ship Rat-free island within its former natural range, namely in the Southern Cooks. Because the last Queen of Rimatara protected the bird we also recommended that this be honoured by changing the usual English name from Kuhl’s Lorikeet to Rimatara Lorikeet. Fieldwork undertaken by several people soon made it clear that of the peopled-islands in the Southern Group, only Ātiu and Aitutaki did not have Ship Rat, and were therefore the only candidates for establishing a reserve population. Aitutaki was ruled out because it has the Blue Lorikeet, locally called Kurāmo‘o, which would compete with the reintroduced lorikeet for food and nest sites. Ātiu was therefore the only peopled-island suitable for a reintroduction programme. 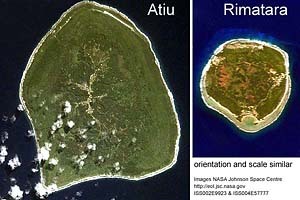 Ātiu and Rimatara are very similar. Geologically they are both raised-islands, consisting of central volcanic hills, surrounded by a discontinuous swampland, which is inside a rampart of ancient reefal-limestone (makatea) – continuous on Ātiu and discontinuous on Rimatara. Ātiu, at 6km diameter, is twice as wide and more than four times the area of Rimatara: 29km² to 9km². On both islands native forest continues to thrive on the rugged makatea; the infertile inland hills are covered with native ferns and exotic forests; and the fertile lower slopes and valleys have been transformed into complex zone of horticulture. The native plants and the introduced plants of the two islands are very similar. In 2000, the World Wide Fund for Nature sponsored a follow-up expedition to Rimatara to reassess that status of the ‘Ura and the Ship Rat. 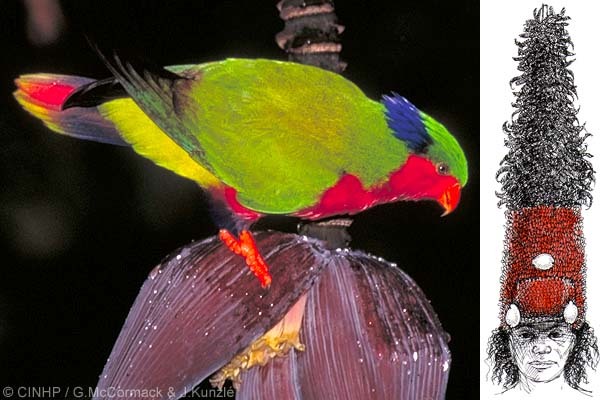 The lorikeet population was estimated at 750 birds, and the absence of Ship Rat was confirmed, while it was noted that Pacific Rat was very abundant in the Horticultural Zone. The ‘Ātiu Queen, Rongomatane Ariki was a member of the expedition and the people of Rimatara agreed to give her up to twenty birds to re-establish the lorikeet on her island. The reintroduction proposal then moved into limbo because of frequent political change in French Polynesia, and in the Cook Islands. In January 2005, a leading ornithologist in French Polynesia, Jean-Claude Thibault prepared a report for the Government of French Polynesia on the birds of Rimatara. In the report he recommended as a matter of urgency the establishment of a reserve population of the Rimatara Lorikeet in the Cook Islands. This was followed in March by a letter from the Natural Heritage Trust to the new President of French Polynesia, Oscar Temaru. Prime Minister, the Hon. Jim Marurai, presented the letter to the President, and subsequently the President requested an assessment of the proposal by the Ornithological Society of Polynesia (MANU). MANU, which had supported the proposal since the mid-1990s, became the French Polynesia partner in the reintroduction programme. In July 2005 BirdLife International included the project as part of their Pacific Parrot Programme, which has been accepted for funding by the August 2006 British Birdwatching Fair. In November 2005 the Cook Islands Government approved the reintroduction and establish a Taskforce. In March 2006 San Diego Zoo agreed to assist with implementation by providing staff experienced in handling lorikeets and a pathologist/veterinarian to implement a rigorous disease management regime. And, in April 2006, the last physical obstacle was overcome – the new Rimatara Airport opened for commercial traffic. In July 2006, the French Polynesian Ministre de l'Environment organised a meeting in Tahiti of all relevant government agencies and they all showed positive support for the proposal. As expected the most critical issue was the adequacy of disease control, and an emergent idea was the need for a government-to-government MOU. The Cook Islands is a party to the Convention on Biological Diversity (CBD), which has as a fundamental goal, the equitable sharing of the benefits of biodiversity. In the case of the Rimatara Lorikeet reintroduction, the people of Rimatara are showing great conservational awareness in allowing a reserve population to be established on an island in another country, and great generosity in allowing Ātiu to regain a bird of cultural significance, and a bird that will be important for Ātiu ecotourism. In the spirit of the CBD, there will be a community-to-community Memorandum of Understanding in which Ātiu people acknowledge themselves as custodians of the lorikeet, that the people of Rimatara remain the sole owners of the bird, and that any future export of lorikeets from Ātiu will require the approval of Rimatara and a sharing of benefits. While the community-to-community MOU captures the spirit of the CBD for the communities it would not stand in international law, which is why the International Relations Department at the July meeting proposed the need for a government-to-government MOU. In addition, if suitable arrangements can be made, the Pacific Pigeon (Rupe, Ducula pacifica) will be concurrently introduced from Ātiu to Rimatara or another island in French Polynesia. A team from San Diego Zoo, with support personnel from the Cook Islands and Tahiti, will capture and transfer the lorikeets on Air Rarotonga. With the support of government officials in French Polynesia and the Cook Islands to make suitable immigration and quarantine arrangements, it is planned to reintroduce the lorikeet in July 2007. Although there are no known serious bird diseases in French Polynesia or the Cook Islands, the San Diego vet/pathologist will implement a rigorous disease protocol. The proposed concurrent pigeon transfer will mainly involve a team from the Department of Conservation in New Zealand, and it will also have a rigorous disease management system. The transferred birds will be banded and during the first four years CINHT and TIS will work with Ātiu residents, especially the senior college students, to map the location of all transferred birds and their offspring, which will not be banded. If breeding success is unreasonably low an intensive investigation will be undertaken during the breeding season to identify problems and develop solutions. This report has been updated as the programme has advanced. This version was created 5 August 2006. An earlier version was published in the CI News 6 May 2006. McCormack, Gerald (2006) Rimatara Lorikeet Reintroduction Programme. Cook Islands Natural Heritage Trust, Rarotonga. Online at http://cookislands.bishopmuseum.org.